I am finally getting around to posting about my holiday break and the end of my catastrophic 2009. Fittingly, 2009 started in the emergency room and it ended in the emergency room. I guess that is appropriate. 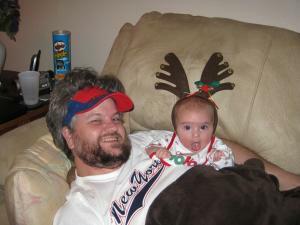 Regardless of my 2009 health events both my family and I are perfectly healthy and looking forward to a good 2010. One of the things I was most excited about was finally getting to see my new 4 month old niece for the first time. This is my sisters first child and while I may be a bit biased, she is a beautiful baby girl and you can’t help but smile looking at her. Here she is wondering who is this wolf/dawg creature that is kissing her. 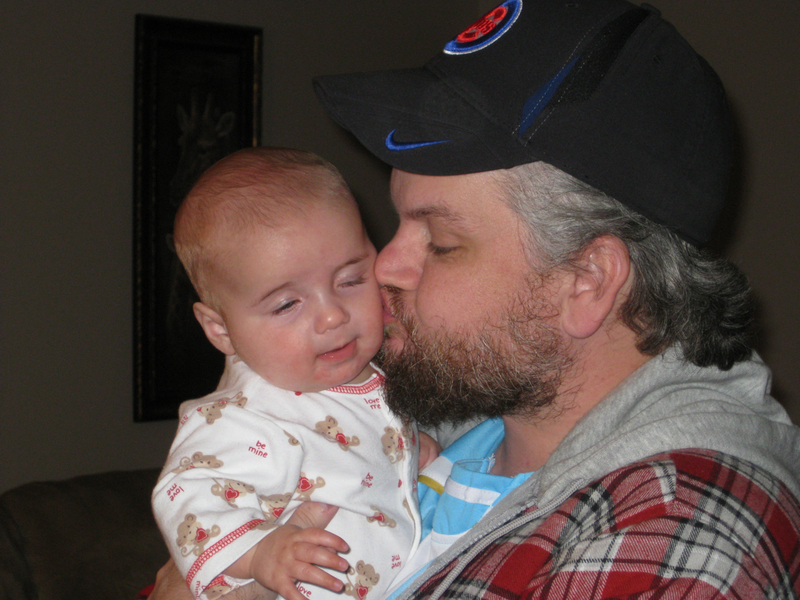 It’s the beard…chicks dig the beard. Here we both are chilling on the couch both with our respective headgear. 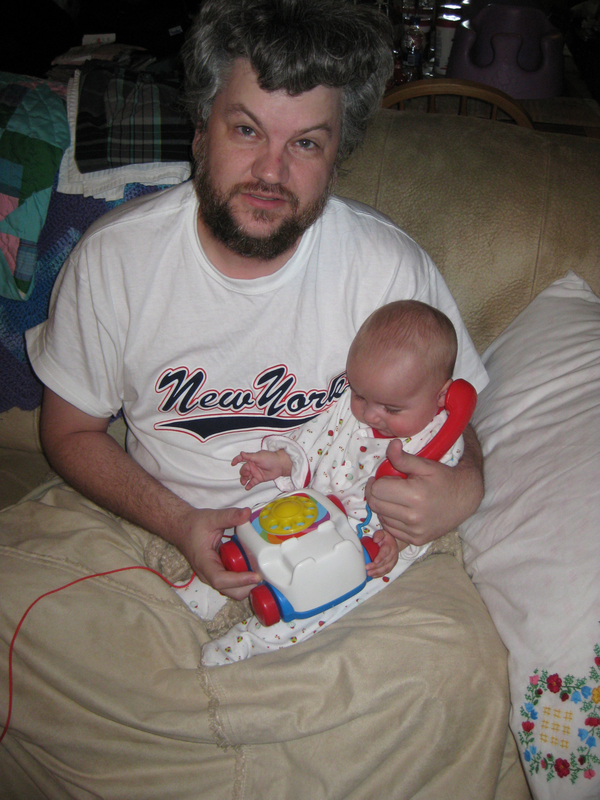 I also didn’t waste any time getting her starting on her hacking career by teaching her the basics of phone phreaking. Both pictures were taken before the haircut so these were the last photos of a creature that might just belong on an episode of MonsterQuest. Due to the aforementioned emergency room visit, it put me behind on a lot of things including the haircut and the fund raiser (which I will wrap up this week, I promise). I *did* get the hair buzzed after I got back home and I did get it filmed to be released in a future episode of HackTV:PWNED. I also have a few photos that I took with the cameraphone that I will post in the Financiers section of the forum. I went to visit my grandmother, whom I have spoken of before, but they put them to sleep in the nursing home very early after supper (it was only 5:30 PM) so she was already in bed when I arrived and I wasn’t able to spend much time with her this trip which was disappointing (and entirely my fault for not staying an extra few days to see more of her). I regret not making more time for her. In addition to spending time with my real family, I spent time with my hacking family as well. I got together with long time friends logosx, zer0db, and meaflux. We hung out and caught up on real life drama (thats what friends do) and talked tech and hax (thats what hackers do) and I missed hanging out with them every month at the BR561 meeting. Luckily I stay in touch with them all and pledge to stay even closer to them in 2010. My rebirth is complete and I am ready for a fresh start on life. I will be posting some big news about my future sometime within the next month so stay tuned for a new direction not only for me personally, but also for the entire binrev family of sites.